Milagu Kozhambu is easy to prepare and also economic at the same time. It doesnt require much of ingredients. Milagu means pepper corns in Tamil . Hence it derives its name from it. It is usually liked by rural tamilans and is served along with rice. Tamarind - a small lemon sized ball. 4 red chilliesa little asafoetida. Soak some handful of tamarind in water. Keep it aside. 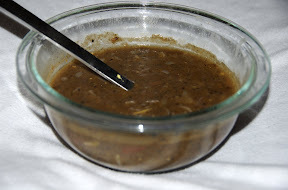 Fry mustard, dhania, tuar dal, urad dal, pepper, zeera, red chillies and asafoetida in little oil. After it cools down, grind itwith a little water into a paste. Heat 1 tablespoon oil and fry mustard seeds in them. When they begin to pop, add tamarind water (earlier kept aside) and heat. When it boils, add the paste and salt. Remove from fire when it becomes thick. Shelflife : 1 day (if refrigerated, then can be used for 2 days). Mix with rice and eat! It can be preserved for a week if a little more oil is used. This Milagu Kozhambu tastes best with Parappu Thogayal.